Current arcade games contain electronics for modern digital synthesizers and samplers to recreate the atmosphere of scenes ranging form race car tracks to high class casinos to extraterrestrial worlds, but the audio in these games has come from humble beginnings. The very first arcade games were precursor slot machines like those developed by Sittman and Pitt in the 1890s, a long time before the computer revolution, where physical bells were rung by the machine on payout. In these days volume and the tempo of the rings were the only sounds available to engineer. Fast forward to the inter-war period and pinball machines had risen to popularity, with Gottlieb & Company’s Baffle Ball the first known pinball precursor produced in 1930, and entertainment machines moved away from the focus on gambling to offer a broader appeal. Despite being banned in New York between 1947 and 1976 for “robbing teens of their hard-earned nickels and dimes”, the machines continued to improve the sounds with different bells and generally made the games more visually appealing to play with bright flashing lights and colours. An early game similar to Pong arrived in 1958, developed by William “Willy” A. Higinbotham at Brookhaven National Laboratories in New York, making use of analogue electronics based on vacuum tubes and an oscilloscope display. The game was silent, but once the idea of an interactive video game was in the wild, it was not long before what we now understand as arcade games began to appear. In 1961, three young MIT students (Wayne Witanen, J. Martin Graetz and Steve “Slug” Russel) created the first interactive space simulation “SPACEWAR!” running on the brand new Programmed Data Processor-1 (PDP-1). This was the first time a bleep, a digitally produced sound, came to be a part of a video game. SPACEWAR! inspired Nolan Bushnell to try and create an arcade-ready version of the game, which he developed by 1970 assisted by his friend Ted Dabney. It was a dedicated hardwired machine that could hook up to a television, and was soon acquired by arcade game manufacturer Nutting Associates, which quickly put it on the market as a full arcade game called COMPUTER SPACE in 1971. About 1500 units were built, and the manual noted how it used the conventional speaker on the TV set to produce the sounds of the rocket ship and firing missiles. 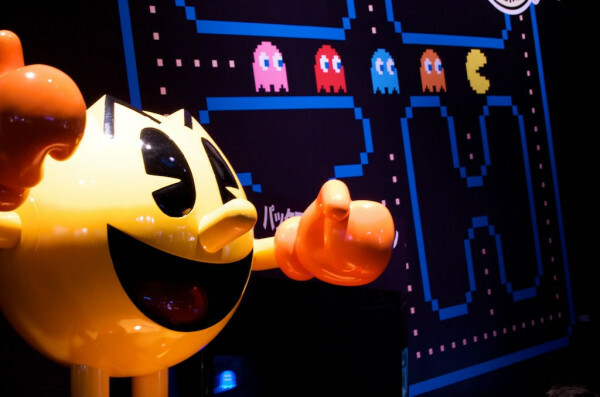 Taito’s 1978 game Space Invaders and Namco’s 1980 game PACMAN are the two most successful arcade games ever, bringing in inflation adjusted revenues of $6.6bn and $7.7bn accordingly. When we think of the classic arcade games, it is these two that comes to mind and they show the ability of a few different bleeps, bloops, and “waka wakas” to express game progress and oncoming dangers. To make these sounds, a specific computer chip would change electrical impulses from computer code into analogue sound waves on the fly for output to a speaker. This allowed for inclusion of music in early arcade video games, but it was usually monophonic, looped or used sparingly between stages or at the start of a new game, such on Pac-Man, the music for which was composed by Toshio Kai. Tomohiro Nishikado’s Space Invaders music was the first a continuous background soundtrack, with four simple chromatic descending bass notes repeating in a loop that interacted with the player, increasing pace as the enemies descended. As advances were made in silicon technology and costs fell, a new generation of arcade machines allowed for major changes in accompanying music, with games using the Motorola 68000 CPU and accompanying various Yamaha YM programmable sound generator sound chips able to create several more sound tones, sometimes eight or more. From the 1980s, some arcade games moved towards digital sampled, sounds, with Namco’s 1980 arcade game Rally-X the first to use a digital-analogue converter (DAC) to produce sampled tones instead of a tone generator, allowing for much greater variation in sound. That same year Sunsoft’s shoot ’em up Stratovox was the first game to use speech synthesis. The 1980s also saw the introduction of frequency modulation (FM) synthesis, first developed by Yamaha, which allowed the tones to be manipulated to have different sound characteristics, further expanding how sounds could be created and utilized with a computer. The following decade saw samples being used extensively in games, with 1991’s Street Fighter II using a large number of voice samples along with sampled sound effects and percussion to create the fight sounds of punches, kicks, and special moves. The resolution of the audio used in games has improved as time has progressed, with the prices of digital memory falling every year. Many games today still use a mixture of high quality audio samples and sampled sounds that dynamically adapt to the game situation for interactivity. Many arcade games today, both gambling video slot machines (Get more information on online fruit machines and slots here) and more traditional video games have maintained many retro styling and sounds, despite the technology being available for producing much higher quality sounds. The PC and dedicated consoles have taken the focus of high quality sound and graphics away from dedicated arcade machines, but under the hood most of these games are still modern computers with the ability to use samples and sampled sounds to create the atmosphere and effects. While a physical bell may still be used to add to the clamour and excitement of a win on some machines, the rest of the game’s sounds are the result of more than 50 years of electronic sound development.